By JEREMIAH WAKAYA, NAIROBI, Kenya, Oct 17 – Electoral areas with unconcluded poll petitions will be excluded from the ongoing Continuous Voter Registration (CVR) exercise launched in Makueni on Monday. 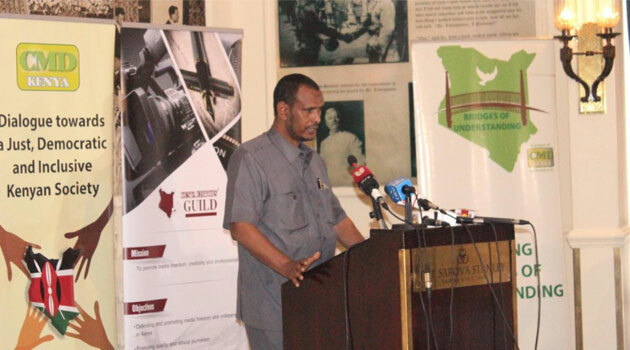 According to Commissioner Abdi Guliye, although the exercise ought to have started after the General Election, the Independent Electoral and Boundaries Commission (IEBC) halted the exercise to allow time for the conclusion of election petitions. “By law we aren’t allowed to engage in CVR 60 days to an election so that is when the process ceases. We had a long electioneering period and an avalanche of petitions – nearly 300 – which meant we couldn’t initiate the registration exercise,” he said. Guliye who spoke on Tuesday during a monthly Kenya Editors Guild Press Club Luncheon said the suspension of the registration in electoral units with pending poll petitions is so that only those who took part in an initial election that is nullified by court are allowed to participate in a repeat election. “Now that most litigation had come to a close except a few before Appellate Courts, we thought we could start the CVR. However, the process will not commence in areas where we have pending disputes,” the commissioner said. During the meeting Guliye also announced plans to publish names of firms awarded tenders for last year’s General Election, and directors of respective companies, in line with an Executive Order issued by President Uhuru Kenyatta on June 13. Guliye explained that the Commission had resolved to publish details of tenders awarded in the run-up to last year’s elections despite the fact that the order was to be implemented prospectively from July 1. “The reason why we haven’t published anything in our website is because we haven’t procured anything as yet. We’ve nonetheless directed the Acting Chief Executive Officer to proceed and compile the names,” the commissioner in charge of operations said. “We had a plenary resolution to have beneficiaries of these tenders disclosed,” he added. The commissioner dismissed as misguided, the debate on whether a quorum hitch could have rendered the poll agency ineffective saying the three remaining commissioners will continue discharging their mandate despite the exit of four colleagues. Guliye observed that Justice Wilfrida Okwany had in a ruling in August held that the commission was properly constituted, effectively bringing the matter to rest. “In any case, we didn’t miss the quorum out of our own volition. It is not wise for anyone to ask us why we don’t have a quorum when it was primarily the decision of other members who decided to resign,” he said. Guliye said the commission was ready to midwife any election in the country including a referendum to amend the Constitution. “We’ll conduct the referendum whether we’re two people from the same ethnic group that notwithstanding unless there are certain part of the country from where we must have commissioners for our activities to be validated,” he remarked. IEBC has encountered turbulent times in the recent past with the mass resignation of three commissioners – Vice-Chairperson Consolata Nkatha, Commissioners Paul Kurgat and Margaret Mwachanya – after a divisive vote on April 6 that recommended the suspension of CEO Ezra Chiloba. Announcing on April 16 their resignations they citied disunity in the IEBC, further faulting Chairperson Wafula Chebukati for treating them with mistrust. During the April 6 vote, Chebukati, Guliye and Commissioner Boya Molu had agreed with the motion to suspend Chiloba. Commissioner Roselyn Akombe was the first IEBC Commissioner to resign on October 18 last year, a week to the October 26 repeat presidential poll citing external interference and lack of independence.